I think last night proved that power is very important to the Grounders. We have so much to talk about today! Maddi and I are excited to be sharing our thoughts about each episode throughout this entire season with you. You can read our recap of "Ye Who Enter Here" here. Now - let's talk about that amazing episode! "Clarke discovers the mastermind behind a devious plan. Kane struggles to keep the peace. Meanwhile, Jasper's grief drives him to reckless behavior." Maddi - The 100 opens with Lexa informing the war council in Polis, after the Ice Nation's attack on Mount Weather, bringing in the accused to be served their punishment and to get justice for the people they killed. The Ice Nation Queen doesn't hide the fact or defend herself of guilt. The Queen uses this moment in front of the council to hurt Lexa's position. That's why she confessed and allowed herself to be taken in. She calls for a vote, to vote out Lexa as Commander. For this to happen it has to be a unanimous vote for it to succeed. The Queen's plan fails because it is not unanimous, because the Sky People are now the 13th Clan, and they do not agree. Lexa is luckily saved. Was it by luck that they became the 13th Clan at the right time, or a plan, in case this ever came to happen? 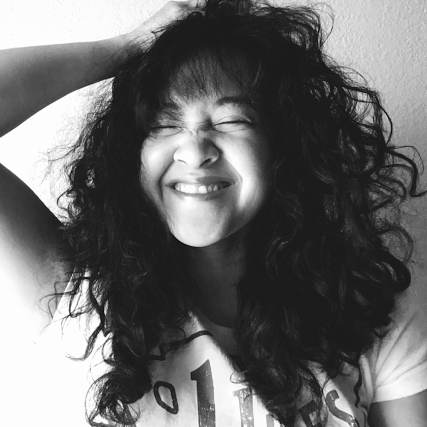 Kristy - I like that idea, that making the Sky People the 13th Clan was to avoid de-throning Lexa was all a plan. The Sky People have an agreement with Lexa as the Commander and they know that this could all change if someone else replaced her. I was also a bit shocked to see everyone, except for Clarke, vote out Lexa as Commander.. Talk about betrayal! I can't imagine how she felt to be surrounded by such disrespect amongst her own people. You can tell Lexa was a bit shocked by this also, but she recovers quickly. M - The Queen goes back to her back up plan and issues the challenge to remove Lexa from Commander. A fight to the death, warrior against warrior. 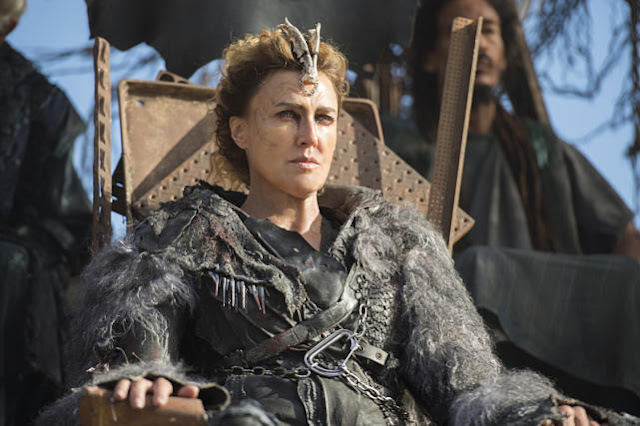 The Queen is up to something as she chooses Roan as her champion, and he is not pleased. I'm not sure if he agrees or not, or if he's in on it or not, but everyone knows that Lexa will fight for herself.. and so does the Queen. K - "I'm the Commander. 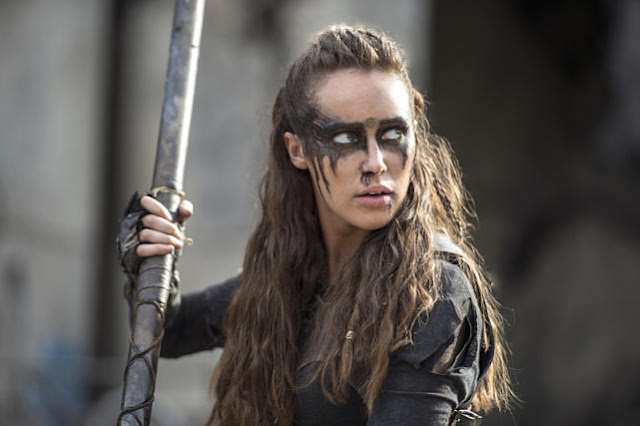 No one fights for me," Lexa continues to prove how strong she is. I wasn't surprised that she decided to fight herself because she's proven to be that type of person. M - We then flip to Arkadia, as their leaders meet. They're discussing Ice Nation, and what happened at Mount Weather. Of course Pike wants to immediately strike back.. what's that going to achieve. All he cares about is the death of the Grounders.. no the annihilation of all Grounders. K - I think it was Jason Rothenberg, who tweeted out that we should remember where Pike is coming from. He has lost almost all of his people, the ones who came down with him from the Ark, to the Grounders. So I can understand where Pike is coming from. I get it. He's having a hard time believing that any Grounder is good because he's suffered from so much evil from them. M - Pike says, "In my experience Grounders understand one thing. . . strength. It's simple we need to hit them now, we need to hit them hard. . . leave no survivors." Yeah it is simple Pike.. The Grounders vastly outnumber you. There are thousands. They have armies and trained warriors. Where is your logic, how do you expect to win that war. The risk is far too great. The chance of winning that fight is so small that it's unthinkable, unimaginable, and unhopeful. You don't stand a chance and neither will your people. M - Thankfully Kane has some sense and understanding saying the attack was against Lexa not them, that they were collateral damage. It may be hard to accept that and sit there without acting but it's better than starting a war. The Ice Nation wanted to start a war and by Lexa issuing war or the Sky People answering with an attack you're giving them exactly what they want, and just helping along with their goals. K - Again, I see the pain behind Pike's emotions and how he wants to retaliate against the Grounders.. There are things that are clearly going way over his head though. He doesn't understand that all the Grounders aren't the same, and how this was the Ice Nation and not the Grounders who are going to help them avenge their fallen people. M - You can clearly see Pike is going to split the Sky People right down the middle. The people who have reason, who just want peace and live happily, against the people that don't want an alliance or to live or to work together with the Grounders. They pretty much don't want anything to do with any Grounders, which includes living on the same ground as them. K - Which is ridiculous, in my opinion. Why wouldn't they want other people to co-inhabit with on Earth? If you go back and look at Polis, you can see how great of an ally the Grounders would be with the Sky People. M - Kane and Abby obviously disagree with striking back. Pike is angry and unsettled with this decision as Abby strongly shuts him down and he walks out. Bellamy enters as everyone leaves. He hands down his guard jacket, signifying that he's resigning. Bellamy broken and clearly blaming himself for what happened. He was a part of the decision to leave the Mountain and for Gina to stay there. To him he has failed to protect the people he swore to protect. He no longer feels worthy to protect them anymore. K - What a great moment shared between Kane and Bellamy. If you just look at their journey from season 1 to now, it's amazing to see how much they have grown, and how much trust has been built between them. It broke my heart to see Bellamy so completely lost. 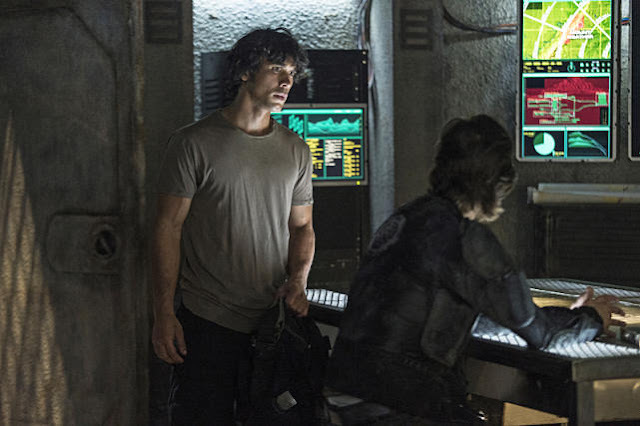 He's lost Gina, and he's lost Clarke.. again. He feels like he is losing Octavia because she told him she plans to leave, and I think he feels like he has no one right now. I just wanted to hug him. M - Suddenly they have visitors. . . Grounders. Tensions are high as the people are not happy they're here. 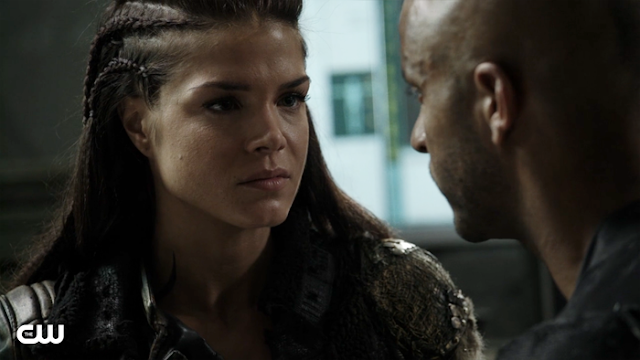 Octavia stands up for them and is labeled one of them. They're already starting to place her and see her as one of the Grounders. Just because she treats them as people, speaks to them, and follows some of their ways. This frustrates me because people are people, no matter what they look like or where they come from. You can't hate everyone who's associated with people or someone or something that has been done in the past, or because you can't accept the difference. K - I completely agree with Maddi. 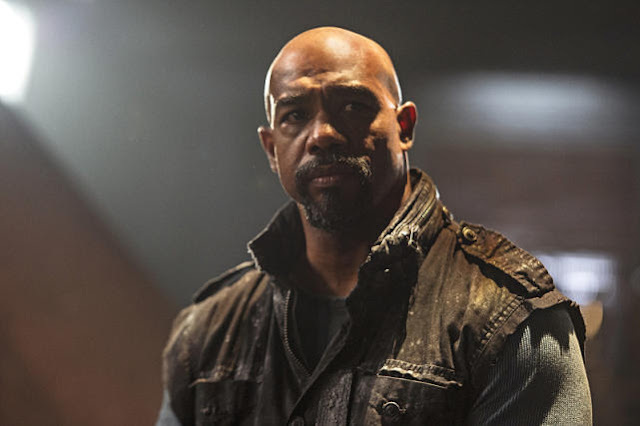 I think we are beginning to see that split you were talking about, where there are some of the Sky People who just want peace and others who don't want to live with the Grounders at all. K - As the Grounders are arriving, we also see Monty and Jasper arguing because Jasper doesn't want to go to the memorial the Sky People are going to have for the people lost at Mount Weather. He tells them, "It's kind of late for a memorial, don't you think?" My poor Jasper, who I completely understand where he is coming from but I still see how Monty wants him to sympathize with what's happening now, too. M - Jasper sneaks out of camp as they're on locked down, and Monty follows. M - Clarke goes to visit Lexa. Lexa's instructing the Nightbloods, children, which one of them will become the successor of her if she dies. Clarke worries for her people if something happens to Lexa. Lexa reassures her as most likely successor Aden will, and he promises his loyalty to the 13th Clan. This is the second time we've seen Aden and I noticed it last week that there's a dark feeling about this kid. I have a feeling he will soon succeed Lexa, and I don't think he'll be a friend of the Sky People. I think he's capable of more than we expect or can see. We will just have to wait and see..
K - Lexa continued to surprise me this episode. I've always found her strong and a great leader, even if her ways were brutal to the Sky People. During this exchange there was a part of her that felt afraid of a death to come, but a part of her that would do anything to defend her title and show her people how strong of a leader she really is - in case they forgot. I am enjoying getting to know Lexa a lot more than we did last season. M - Roan calls out the Queen saying she's not doing this for him, and she encourages him to fight for his Clan. I think the Queen is threatened by her son, I know their people would easily see and choose him as their leader, and stand with him over her. Clarke also sees this. She tries to intervene, always trying to save everyone, as she tries to get him to kill the Queen and become King. Of course Roan won't kill his mother but he wants to help Clarke do it. This had me concerned. I didn't think Clarke should do it. Has she forgotten all of this has been a plot all along, and it could just be another step in their plan. K - Back at Arkadia we find the Sky People holding the memorial for the people lost at Mount Weather. I thought it was beautiful, especially when Bellamy gets up to talk about Gina. We continue to see how lost he is, and how much these deaths (especially hers) is weighing him down. M - I admit I thought Pike was going to use the ceremony to get the people on his side, to use their deaths for his advantage and agenda. I was close, instead he uses the nearby Grounder army protecting them. The people don't see the army as help but as a threat. They're petty much just a giant pot that's ready to boil over.. at any second. It does boil over as the people freak out that the Grounders will kill them all and of course they take it out on the nearest Grounder.. Lincoln. The guy is attacked but he doesn't fight back, he stands strong as they try to kill him. Lincoln deserves so much more, not many people could just stand there as people try to harm them, understanding that responding would make it worse, nor is it the right thing to do. After everything he's been through he's still not giving up. K - I absolutely love Lincoln. He just wants peace. He just wants to be accepted by the Sky People to show how the Grounders could easily get along with living side-by-side with them. He is such a strong person, he doesn't show any hate more like understanding as he tells himself, "get knocked down, get back up again." M - Jasper and Monty end up at the drop ship. A struggling Jasper is losing himself more and more, day by day. Yet Monty continues sticking by Jasper, no matter how much he pushes him away, or how much he treats him poorly. Monty finds that Jasper has taken Finn's ashes and confronts him. K - Coming back to the dropship brings back a lot of pain even as a viewer of the show. I feel like the Sky People, especially the original 100, have lost so much since they first hit the ground and it breaks my heart. Finn is a part of that heartbreak, too because I remember how lost he became and I worry for Jasper because I don't want him to become that lost. M - Jasper's making himself worse by doing this to himself, he's trying to hurt everyone involved in what happened at Mount Weather, by taking Finn's ashes, it's taking away Clarke's chance of forgiving herself and being able to let go of what she did. He's also adding more pain and regret as he makes more bad decisions. He needs to stop punishing himself. Monty gives him an ultimatum, telling him he's not fine either but going on like this and destroying himself and his life is not the way. It's time to start dealing with it and to get himself together. K - Going back to how much I love Lincoln.. We continue to see how much he wants peace when he decides not to press charges against the person who attacked him. M - Octavia wants to leave now that the kill order on Lincoln is gone but Lincoln knows that the only way that the Sky People will see them as different from the Grounders and the Ice Nation is to stay and show them they're not all the same. M - Clarke meets with the Queen and uses that she's changing her vote as a distraction to get to her. I knew what Clarke was doing and I couldn't believe it. Clarke's plan fails, she risked the safety of her people for Lexa, and now she's made the Sky People enemies of Ice Nation. Like Kane said, they were collateral damage but now it will be their war because of what Clarke did. Ice Nation wanted this, now they have a reason to attack and kill your people, a reason they can use against you, to break the treaty because you tried to assassinate their Queen. What was she thinking? Then, we learn that the Queen has her own Nightblood, and it shows how all of her actions now make sense. It turns out they also have unique black blood that goes all the way back to the first Commander.. apparently it'll be explained more later on. M - Bellamy and Pike are having a drink, Pike clearly up to something as I noticed Monty's mum watching and waiting for something in the background. Pike uses Bellamy's pain and guilt and takes advantage of it, manipulating him with the blame he has already put on himself, like throwing fuel on a fire. Bellamy made the decision to trust Echo and Pike uses that to turn him against all Grounders, but they're not all the same just look at Lincoln. They use Bellamy to get ammo for their guns so that they can go slaughter the Grounder army of 300 people nearby. K - Everything about their exchange made me angry. It made me angry that Pike was completely taking advantage of how lost Bellamy is at the moment. It made me angry that Bellamy allowed someone to walk all over him and his beliefs because deep down he knows that not all the Grounders are the same. I think I understood then why we see Octavia beating Bellamy up in the season 3 trailer. M - Pike's trying to save them, save them from nothing, there's no threat, the threat is the Ice Nation not every Grounder that exists. I hoped so much that Bellamy didn't agree, that he didn't do it, that he didn't give into those bad feelings leading him to a dark place. He's come so far since the beginning, but he does, he arms them, and they go marching as a vulnerable Bellamy loses his way. They're running on anger and hatred instead of reason and logic. They're not seeing what's there but what they fear.. And to anyone hating on Bellamy remember how much he's been through, how much everyone's been through. Grief can turn you into something you're not. K - Time for the fight! Clarke ends up showing up, and for a moment we see how vulnerable and afraid Lexa is. Just like before though, she quickly recovers and unsheathes her sword. M - I know something unexpected will happen and neither Lexa nor Roan will die, but someone has to. When the fight begins and Roan charges at Lexa when her back is turned and she lands a clean strike on him. It was a fool's errand, he's one of the best, he's trained, and he knew better than that. Something was just not right. Long story short, after an epic fight, Lexa only just wins the battle and kills the Queen instead of Roan, who's now the King. K - That fight was amazing. 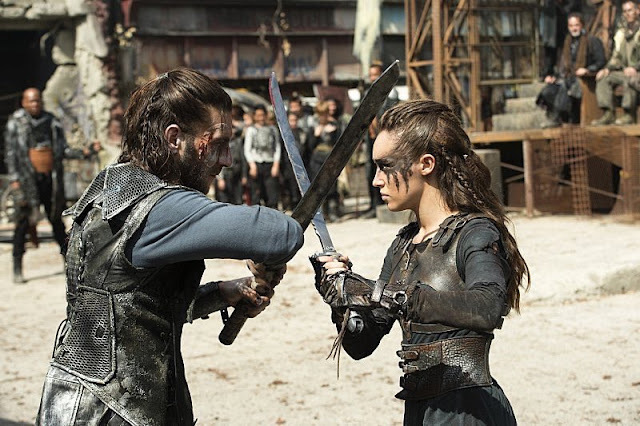 It was awesome to see how Lexa fights, and she is ruthless but so was Roan. 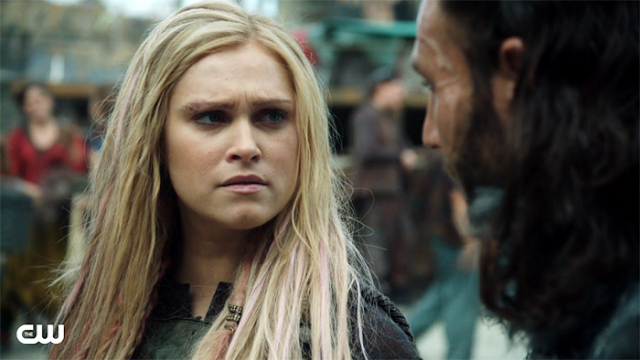 We can finally see how much power truly means to the Grounders.. like we weren't convinced already. Things certainly become more interesting when Lexa kills the Queen and announces Roan as the Ice Nation King, "The Queen is dead. Long live the King." Is anyone else surprised that the Queen didn't have a longer presence on the show? She was such an interesting character, and even though I didn't like her, I did enjoy the dynamic between her and Clarke. I would've loved to see more interactions between them. M - Surprisingly the Queen didn't last long, for someone that's smart and with a plan in motion, we didn't see it coming.. or did she. It could be a giant plan with Roan. If she dies, he becomes the King and we all know they trust him more than her, and will even more now that she's dead. Also they're trained warriors yet she didn't see the attack coming nor did she even respond to move out of the way of the spear. I find that odd. There was enough time for a reaction. M - Pike, Bellamy, and the others head for the camp gates. Lincoln, Harper, and Monroe stand in the way. 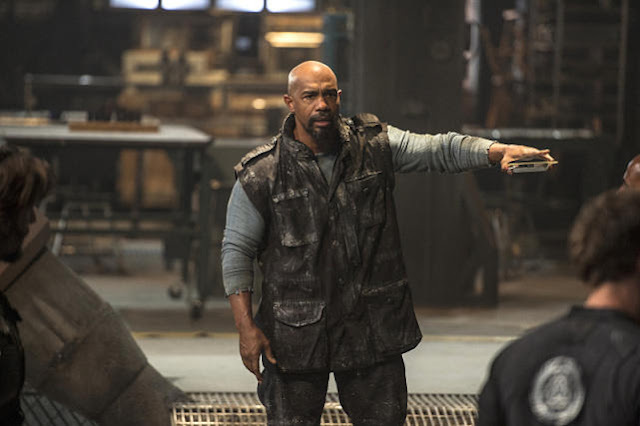 Bellamy asks them to trust him and they move but Lincoln stands firm. They say for him to prove himself as one of them he must move aside. Lincoln doesn't have to prove he's one of you by letting you kill his other people that would be like making him let you kill his own family. What they're asking is unforgivable. Lincoln was trying to do the right thing and to stop them from doing the wrong thing. Kane, Abby, and the others stop them and arrest them. They find out Kane took the mark of the Grounders and this just makes things worse. Pike uses it against them, the pain and anger, the hatred, the want for revenge, the fear. It's easier to let it overcome you then to continue fighting it, or to move on, or to make peace with the people that hurt them. Everyone wants Pike's name on the ballot for the vote for the new Chancellor and we all know that this is bad and it will certainly not turn out well. K - The Grounders wear their mark with pride and it's crazy to see that the Sky People look at it like it's a mark of betrayal from Kane. Bellamy can't seem to even look Kane in the eye as he shows off the mark. If Pike becomes the new Chancellor then I see a bad and scary future ahead for the Sky People. M - Lexa visits Clarke to thank her. Clarke says she did it for her people. Everyone knows you weren't doing what was right for your people, you were doing it to save Lexa (and almost kill your people in the process). I may not prefer Clarke and Lexa together but even I can see that! K - I completely agree with Maddi, because I don't prefer them together either but I can see how deeply they care for each other. It completely shows in the way Lexa lets her vulnerable side show in front of Clarke. She comes to her room after dark, with no face paint, her hair down, and no armor. I saw it as Lexa maybe showing Clarke that she cares for her as well. M - Pike is voted the new Chancellor and he will lead them to their doom, unless he comes to some sense, and he will regret it when his people die, and it's by the fault of his own hand. The first thing Pike does is pardon himself. He can't see reason and he can't even accept his wrong actions, what will happen when it comes to his mistakes.. He foolishly removes the Sky People as the 13th Clan of the Grounders. Without the support or protection of Lexa they're in a lot of trouble. Pike is single handedly going to start a war. This also puts Lexa in a bad position, if she tries to help them now, a full on war might break out because she would be helping the enemy if they are no longer a part of the Coalition. K - I might still be in a little bit of shock that Pike is actually the new Chancellor, and I'm not sure how this is going to play out. I'm nervous because I know what he wants, and that's revenge against all Grounders. He's definitely not putting his anger towards the right thing, and I think sooner or later he's going to realize this and by that time it might be too late. K - I completely agree, especially seeing what Jason said about them. He's obviously making that statement true by them being apart and making these reckless decisions without one another. Unfortunately, the Sky People are the ones suffering from these decisions because we all know how much power Clarke and Bellamy truly hold as leaders to their people. M - The episode ends with Pike, Bellamy, and his group taking off to finish what they started. I hope so much that it doesn't happen but I don't think anyone can stop this one. . .
K - There is so much that is sure to happen in the near future. Like I said I'm nervous to see what will happen after Pike's plan goes through, and how it affects everyone not just him and Bellamy. 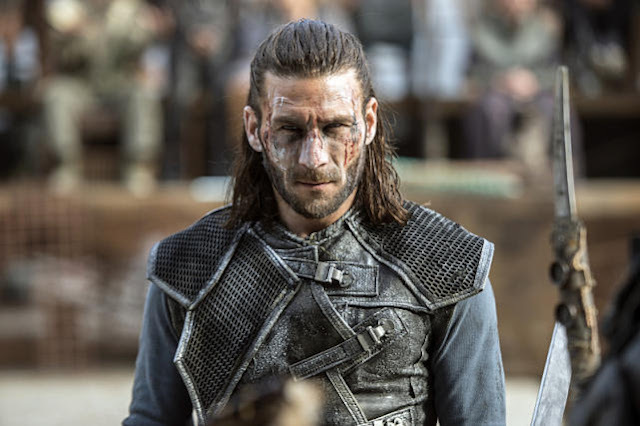 I'm curious to see how Roan will be as the Ice Nation King. I'm also hopeful that this will bring Clarke back to Arkadia and her people.. so much death is ahead of us and it's only the beginning. Join us the following day as we recap episode five. 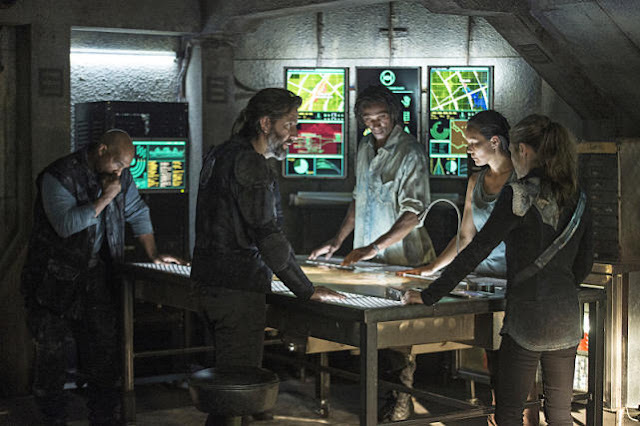 We can't wait to discuss all things The 100 with you!